If you're in charge of maintaining all your equipment and machinery within a construction business, you need to make sure you do not neglect your machines' cleanliness. Keeping your machines clean might not sound like a top priority because they are constantly operating in extremely unclean construction projects, but it's an absolute necessity if you want your machines to remain functioning for many years to come. Final drive motors, for instance, are essential for excavators and other types of heavy equipment, and they can be ruined if they aren't properly inspected and regularly serviced with clean gear oil. Hopefully, this guide will help you understand the importance of keeping your travel motors, final drive motors, and all other types of machine equipment components cleaned and regularly cared for. Increased durability -- If you aren't cleaning your construction equipment, it's not going to last nearly as long as it should. Abrasive materials like dirt, sand, grit, rock, and concrete can increase wear on construction parts, especially the undercarriage. Simply cleaning away these materials can easily remove this buildup and keep your machines running well for many years. Improved fuel efficiency -- Clean machines run much better because all that debris and dirt is not packed away inside wheels or tracks. If there is a lot of filth on your machines' wheels or tracks, it will certainly negatively affect the fuel economy. Prevent corrosion -- Cleaning your machines will help prevent expensive damage from corrosion. Road salt, deicers, fertilizer, and other materials found on a construction site can cause major corrosion issues if they aren't washed away, so get cleaning! 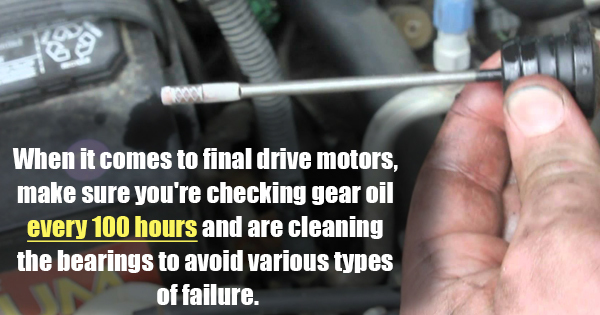 Specifically, when it comes to final drive motors, make sure you're checking gear oil every 100 hours and are changing the gear oil at least once a year, or at the recommended hourly service interval, by draining the dirty gear oil and replacing it with new clean gear oil. Finally, make sure your construction company has a regular schedule for cleaning and maintaining equipment. Make sure there is a schedule for the visual checks and maintenance that need to be performed daily, weekly, and monthly.